Extra Details: I started with a white panel slightly smaller than a standard A2 sized card. I stamped the umbrella and sentiment first. I covered them with mask made from a post it note. 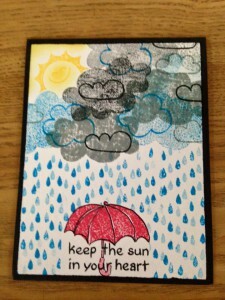 I stamped the sun and clouds next. I used some first and second generation stamping to get lots of dimension in the clouds. 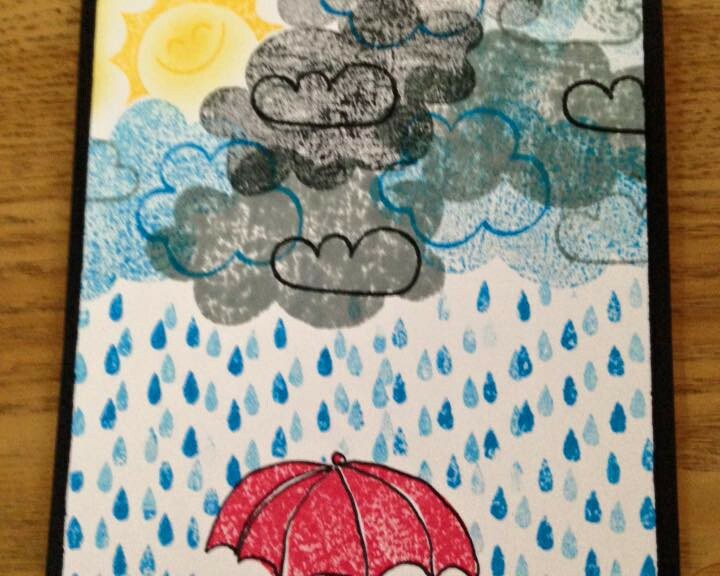 After the clouds were finished, I stamped the rain drops. 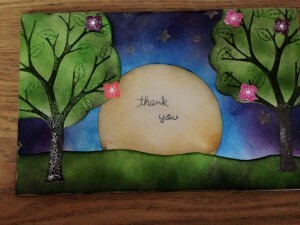 I also used first and second generation stamping to create dimension here. 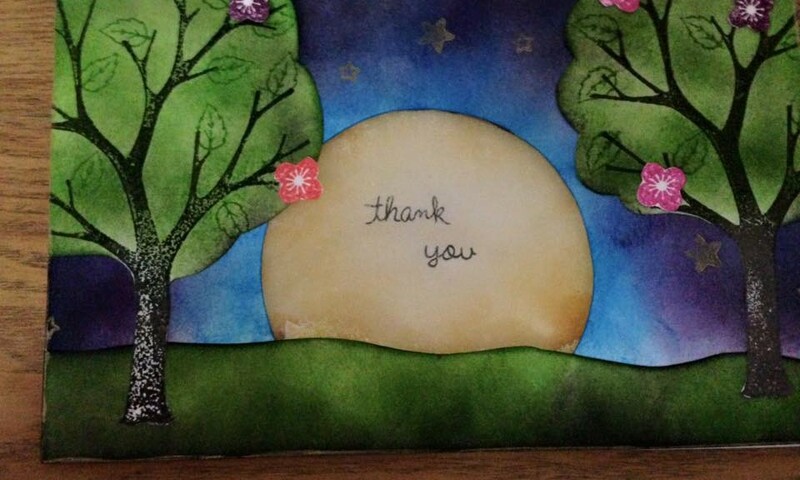 I used an ink dauber to add color near the sun. Lastly, I adhered the stamped panel to a black card base. I love the fruit images in the Summertime Charm stamp set, so I made a card featuring them. I also tried the rock n roll technique to get two colors in one stamped image. Extra Details: I started by stamping the sentiment on white card stock. 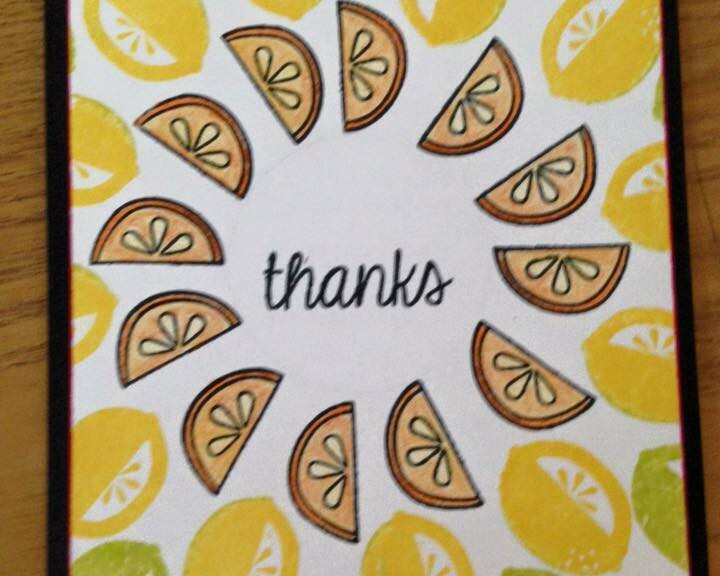 I stamped the fruit images in a circular shape around the sentiment and worked my way out to the edge of the panel. I used an ink pad to color the edges of my white panel. I put the stamped panel on a black card base. My mother in law gave me two new stamp sets and some Distress Inks for my birthday. 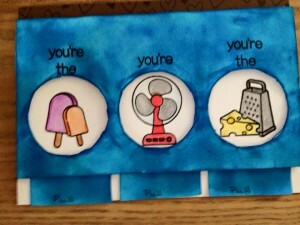 She is the greatest, so I needed make her an awesome thank you card. 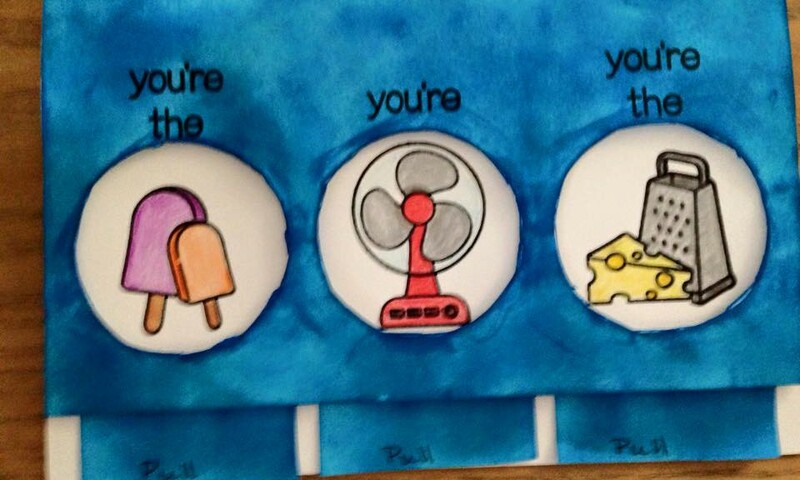 I also wanted to try making an interactive card. It was my first attempt so it’s not very pretty. At this point, I also did not own a die cutting machine or any dies so everything was hand cut or cut with my very old paper trimmer. Extra Details: I ink blended the top white panel after cutting the circle out. I stamped the sentiments right about the circles. 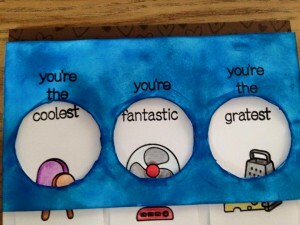 I created the white pull tabs and stamped the images and sentiments where they could be seen. I colored everything with colored pencils. I added fun foam where I needed it to make the card work. I adhered the interactive portion to a brown card base that I had stamped some tone on tone hearts on for added interest. For my birthday, I received some mini Distress Ink cubes. I could wait to play with them. 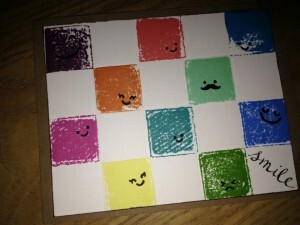 This card I created using direct to paper stamping with the ink pads themselves. Extra Details: I scored a grid on my white card panel. I used this grid to help me stamp my ink pads into a neat pattern. 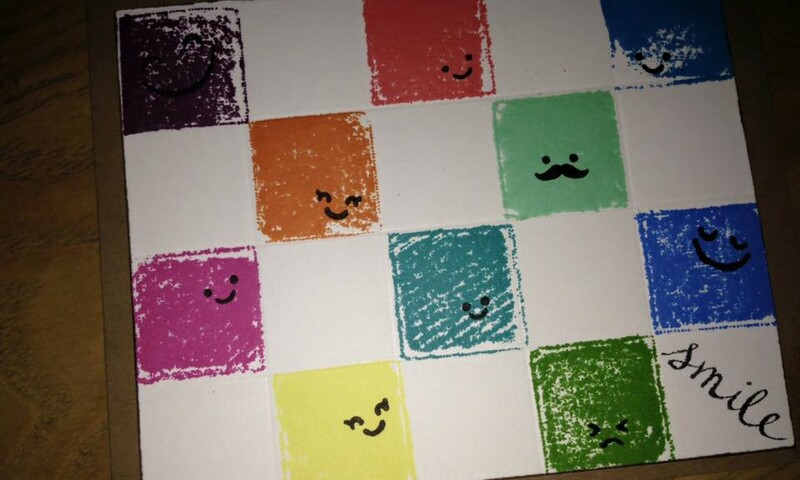 After I applied the Distress ink squares I added cute faces using a number of different Lawn Fawn stamp sets. I added a sentiment in one of the open squares. Lastly, I adhered the panel to a light brown card base. 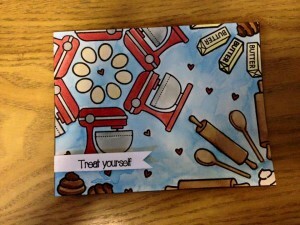 For my birthday, I got 20 mini Distress Ink cubes and The Baked with Love stamp set. I was so excited and could wait to use both of them. Every time I looked at Baked with Love, I remembered an old Target ad campaign where they would use everyday objects to make circular patterns. I tried to recreate that image with this card. Extra Details: I started by stamping the images on water color paper. I used Distress Inks to water color everything in. After the panel had dried, I adhered it to a card base. I added a small strip of white paper to highlight the sentiment. 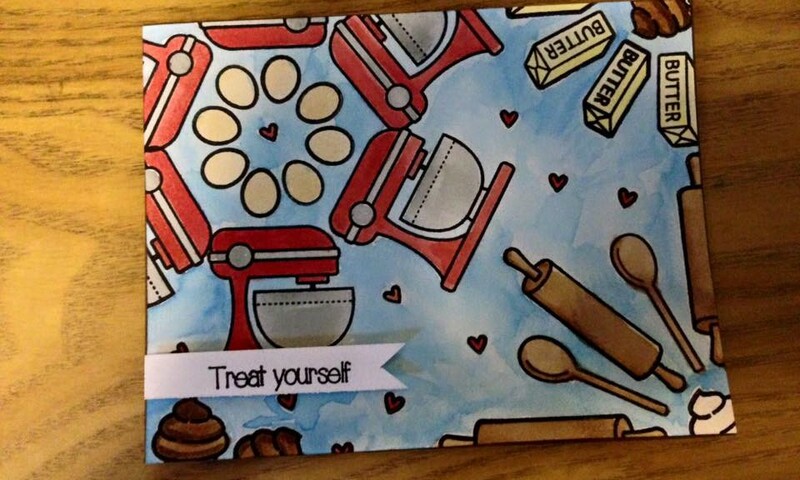 I wanted to play with the new to me Best Pun Ever stamp set, so I made this note card. 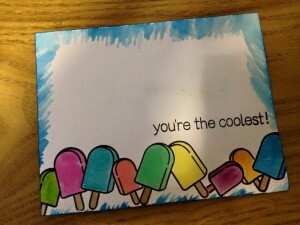 Extra Details: I used masking to create the line of popsicles at the bottom of the card. I water colored them in with Distress Inks. I lined the edges of the panel with blue ink. I used a wet paint brush to sweep the color towards the middle of the panel. This was my first attempt at a shaker card. At this time, I did not own any sequins, so I made do with glitter. I love the way the design looks, but I was a bit disappointed in the shaker element. 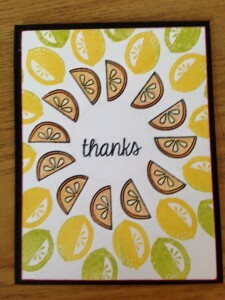 Extra Details: I did a lot of fussy cutting for this card. The grass, trees, leaves, and flowers are all fussy cut out and layered on the blue panel. 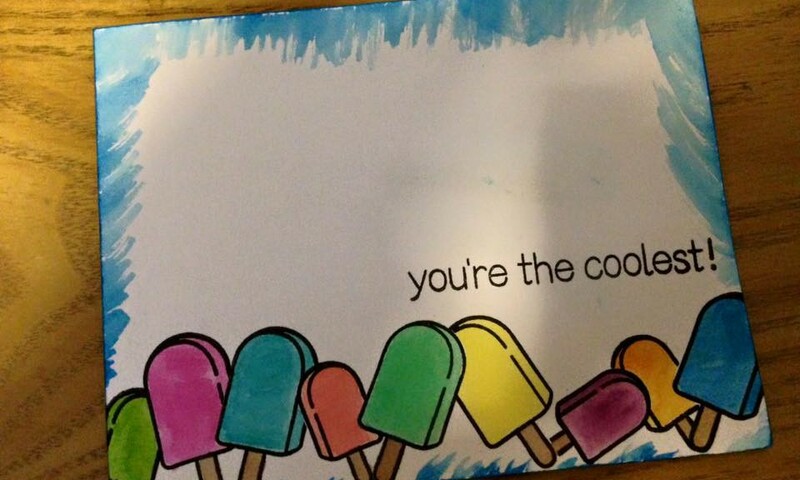 I also did a lot of ink blending for the card. I hand cut out the circle for the moon and the leaf canopies. I used a gold pigment ink to put stars in my night sky.